M&I knew from the beginning that they wanted to celebrate their wedding outdoor surrounded by nature. They looked many places along Costa del Sol but nothing was as beautiful and so well looked after as Finca La Concepción in Marbella. The venue and caterer were chosen but they needed help to find the best suppliers to achieve their requirements and it is then when we stepped in to help them. Both, M&I, were very busy with their jobs and even they speak Spanish, could do a research and find the suppliers, they needed someone to guide them and their family in the planning process. For us as a real pleasure to work along M´s family, spend some afternoons meeting suppliers, visiting hotels and having lunch with them in Nerja…. they looked after us which means a lot when we put some much effort and dedication to what we love doing. The ceremony took place in a small chapel closer to the venue where white and baby pink flowers were the colours chosen. Baskets with hydrangeas at the entrance and then arrangements on the altar and on the shelf’s located closer to the altar. The bride´s bouquet was only created using baby pink peonies done by Virginia Floristas. The classical music on the day was performed by Quike Navarro and his group. After the ceremony, the guests were taken to Finca La Concepción. Lepanto did an amazing job on the day providing a good selection of cold and hot canapes, a super tasty 4 course menu, excellent wines and moreover gave a magnificent service. Here the decoration was totally different to the church: bright colours and gold took over the baby pink and white and we thought that it was a great choice. Hats were available for the men if they were hot and different beer bottles were available. The groom and his father made a big container using a wine barrel. The bride loves Frank Sinatra and Martin Joseph did an amazing job performing the best songs from Sinatra´s repertoire. As the party was for over 200 people, we find very difficult sometimes to the guests if they are listed per table so this time, Nulki Nulks created the table plan using cards with Letters and placed in alphabetical order. It was much easier for all the guests to find themselves. 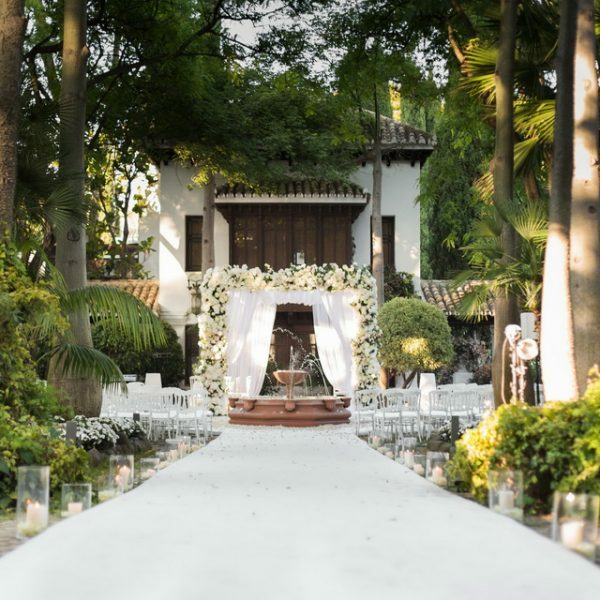 Virginia Floristas supplied the structure to do the set up and decorated it with Buganvilla from the bride´s family finca in Nerja. Candles and fairy lights were set up in the tree and above the dining area which took place around the fountain. The lighting was done by AllSol. The photographer on the day was Romance Weddings and as you can see they reflect M&I personality. They are simple, elegant and romantic. We like seeing this kind of photography as well when it is all about the couple, their friends and family enjoying this special day. Their wedding video was done by AnkerProd. Thank you so much to M&I and their families for letting be part of such a beautiful and memorable day.